Plenty of artists see the world through a slightly different lens. Jamie Wayman is no exception. She just happens to see the world from a vantage point at the bottom of a swimming pool. The exhibition Making a Splash: New Swimmer Paintings showcases beautiful, whimsical works that distort everyday poolside scenes. 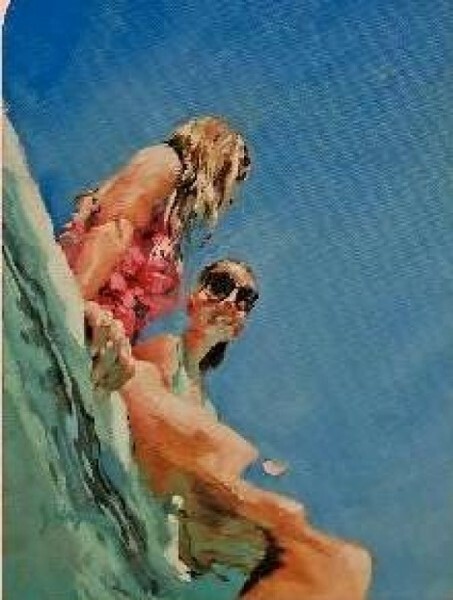 “Pink Hat” finds a father introducing his baby to the pool; “Sisters in Summer” (pictured) captures a casual conversation between siblings. Wayman plays with the rippling bodies of her subjects, the light of a clear summer sky, and the clarity of the space beneath the surface. As the season draws to a close, get one last splash. Just remember as you look at the art that even if it feels like you’re staring up from the deep end, you don’t really need to be holding your breath.